I really do apologize for this. 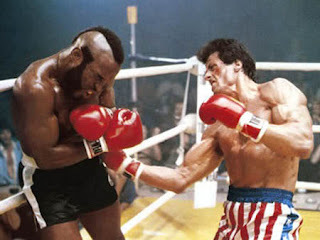 But as I was writing my stewardship sermon, I couldn't get the the Rocky III theme song "Eye of the Tiger" out of my head. Except this 1982 song by the band Survivor morphed into "Eye of the Needle," a reference to Jesus' statement that "It is easier for a camel to go through the eye of the needle than for a rich man to enter the kingdom of heaven." Here's the movie scene with the song if you have no idea what I'm talking about. It does kind of make you want to start training to fight Clubber Lang. Anyway, before I could finish my sermon, I had to get this distraction out of my head. So here you go. I suggest having the choir sing it as the offertory anthem on Stewardship Sunday.